I recently posted a chart showing a short time series showing the number of inventors per patent. The basic conclusion from that post was in the headline: Average Number of Inventors per Patent Continues Steady Rise. Here, I have updated and added to those charts. The first chart below reaches back to 1976 — showing that the average number of inventors per patent has been steadily increasing over all of the past 40 years. The trend has been amazingly steady and linear, and should serve as good fodder for economic analysis. 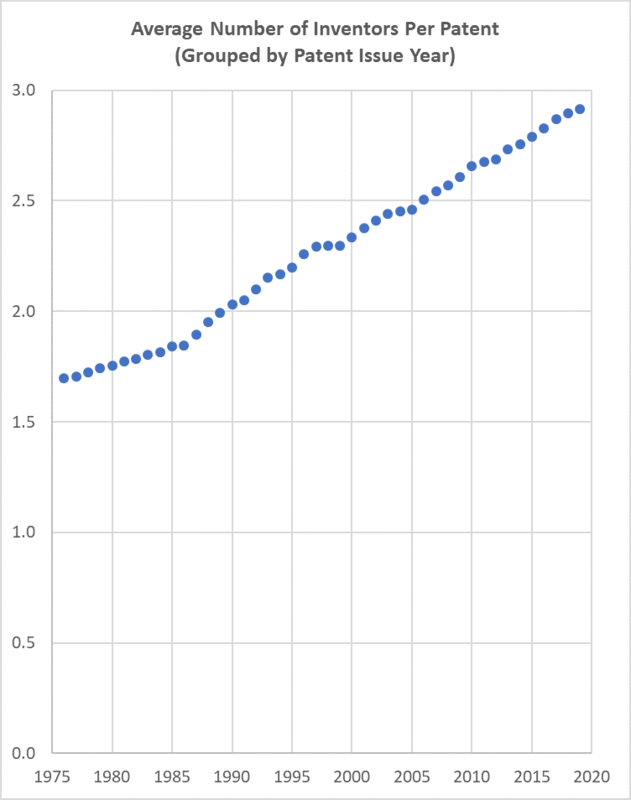 My simple linear model suggests that we’ll top the 3.0 inventors-per-patent threshold by 2021 (both the mean and median). The second and third charts (below) provides a bit more detail and looks to answer some questions posted by James Daily of WashU regarding the underlying distributions. The basic conclusion there is that the proportion of one-inventor patents has dropped steadily — and can be linked with a steady rise in patents listing three or more inventors. During this time, the proportion of two-inventor patents has remained steady at about 25%. 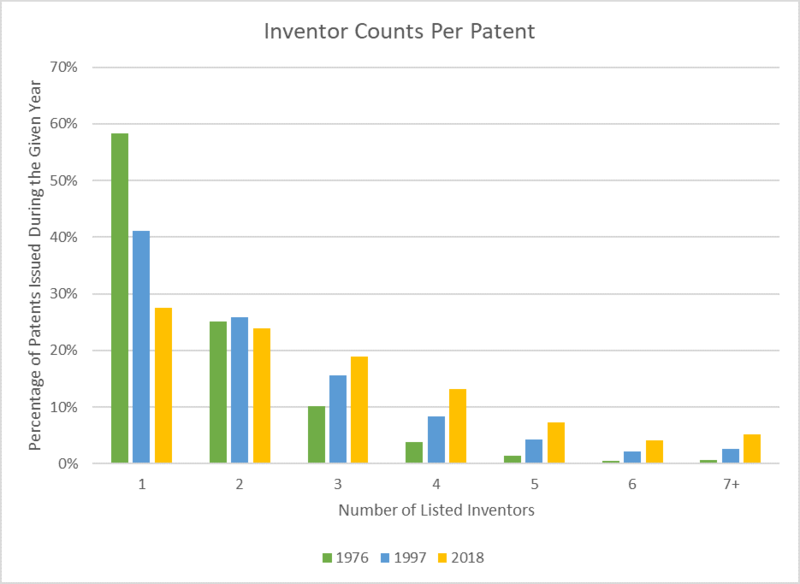 The charts also demonstrate that the growth in 3+ inventor patents is itself skewed: For example, the proportion of patents with 3 inventors doubled during the 43 year span while the proportion of patents with 7+ inventors saw a nine-fold increase. Although the movement was already fully underway, recognize that the America Invents Act (AIA) helps foster this as well by (1) allowing patents to be filed by the applicant rather than the inventors; and (2) weakening the penalty for errors in listing of inventorship. That change was by design and part of what Dir. Kappos notion that major inventions these days are quite often major team projects, and that the patent law should foster and encourage those teams projects at least as much as it encourages individual innovation. Thank you Dennis. Very interesting! Almost begs for more analysis and answers.. Do the Inventor numbers go up, if we only limit the patents to top100 large corporations and exclude others? Do some sectors show different trends (e.g. Chemicals, Biotech vs Electrical, Software)? How about geographic trends – Asian vs Western Europe or North America- Do companies in different regions show different filing trends w.r.t inventors? Lastly – the “so-what” question and perhaps a tentative recommendation – which teams are likely to be more innovative in which regions/sectors? larger teams or more nimbler smaller teams? The data is real but the underlying causes are not obvious. We do know that the patent system has skewed widely in favor of large corporations over the past 30 years. Internal politics abound within these corporate applicants. Listed inventorship in view of these internal political pressures does not equal true conception. Basing policy on an incorrect interpretation of causation would be a bad idea. Even small corporations have increased numbers of inventors. That’s not evident in the data presented. While the graphs in the main story indicate this, the additional graph provided below (post 4.1) really emphasizes the relative weight (and indicates impact) from the wide skew that you mention. Small companies file with more inventors too. Again, not evident in the data presented. not evident in the data presented. Nothing inconsistent about the proposition (which is true) and the data in the table. If you’ve got a reason to believe that small companies aren’t filing with more inventors, then tell everyone what the reason is. Otherwise maybe put a sock in it, Billy (always a good choice for you). Maybe you should read again my post. You simply do not have the same dynamics that you have in place for large companies. If anything the politics relating to inventorship is more intense for the small companies than the large ones. The graph says literally nothing about this “skewing towards large corporations” which is what my comment was addressing. That may be true. Nevertheless, the inventorship numbers at small companies is increasing. As I said, there is no reason to doubt this. Those of us who work with small companies certainly have no reason to doubt it. Probably things look different from your m 0 m’s basement, though. Quite literally, that was my point. Thank you for acknowledging that I was correct in the first instance. Yet again, your conclusory assertion is simply not supported by the data here. But please, go ahead and tell me that I am correct again. “anon”: Quite literally, that was my point. ROTFMLAO Oh my f cking g0d you are a piece of work, which is to say that you are a dissembling pile of hum@n sk u m without equal. Go f ck yourself, @ h0le. What planet are you on? 4.1 is a post by Prof. Crouch providing an additional data presentation that I requested at post 4. IF instead you mean my reply at 10.2 in which I quote someone else, and then add a different point TO that someone else (as IS supported by the additional data supplied by Prof. Crouch at 4.1, then YOU need to check your reading comprehension. That picture at 4.1 DOES tell a very different story than the just the original graphs, and if you had bothered at all with EITHER my reply to you at 10.3.1.1.1 OR 10.3.2.1, then you would have recognized how correct I have been all along. Is this just more of that cognitive dissonance showing itself? Of course I meant 10.2. And there’s nothing further to discuss after that, Billy. Resume your tr 0lling, tr 0llb0y. Other than all of the substantive points that I provided…? as compared to the total LACK of substantive points that you provided…? No wonder you do not want to have a discussion. You appear to not understand what a dialogue on the merits means and confuse that with “Tr011ing” when the discussion is more than your mere feelings (and does not go your way). How “grown up” is that? …and speaking about “true,” maybe YOU want to do more than merely baldly assert that. Not only do you want to pull a position out of thin air (in relation to the actual data presented here), you want to lay a claim about “truth” to this data which exists… where exactly? Additionally, you seem to not be “getting” that the numbers here are geared to an INCREASE OVER TIME (as opposed to an increase directly within a particular type). You provide ZERO backing for any type of driver for any increase within one particular type. So before you get all upset with the fact that I provide you with a small laundry list of possible drivers, and you supply, well, nothing, maybe you want to actually have something to back up those feelings of yours. Heck, I doubt that you even bothered to understand ANY trends for small businesses in the US. It is doubtful that you have any basis for anything that you are saying except your over-inflated sense of importance of your own feelings, and that you FEEL that what you say simply “must” be correct. So before you climb on top of that soap box in your mother’s basement, maybe take a look at trends for small businesses and note how those trends may (but more likely may not) be able to support or align with the actual date presented here. It’s not “pulled out of thin air.” It’s pulled from (1) the data right in front of our eyes; (2) the fact that there is no reason to expect small businesses to be immune from the trend; and (3) my own years of experience (20 years prosecuting, analyzing and litigating patents). So go f ck yourself, tr 0ll. “It’s not “pulled out of thin air.” It’s pulled from (1) the data right in front of our eyes; (2) the fact that there is no reason to expect small businesses to be immune from the trend; and (3) my own years of experience (20 years prosecuting, analyzing and litigating patents). You, being the Tr011 here, should heed your own advice. And you DID pull your view out of thin air BECAUSE your view is NOT supported by the data here. Have you even bothered to inform yourself (notably, with the helpful start that I provided you)? If you had you would not have 1) just repeated the same error, 2) actually learned that the reasons I provided above are reflected in the research (research you could have started with the link that I provided to you), and 3) your “experience” is not worth much – as easily seen in how you “express” that experience day in and day out here. My view is that the data isn’t inconsistent with the banal observation that inventorship numbers are increasing for small company applications/patents. LOL Hundreds of thousands of dollars a year and a lot of free time besides says otherwise, Billy. Keep dancing, Billy! Whheeeeeee! Look at him spin, folks. Just watch out for the tr0 ll juice leaking out of his battery pack. As to “keep dancing” – that has zero meaning in context here. The only one even remotely “dancing” is you as you dance away from the substantive points that I have provided. Is that “context” of your use the typical Malcolm Accuse Others meme? as to your “lot’s of free time,” may I suggest that you do more than regurgitate your feelings and actually learn patent law (preferably the law as written by Congress). You seem to not be using that “lot’s of free time” to any real (even slight) valuable use. Oh but wait! Billy has determined that it’s not his views that are in error (over and over and over again), but the Supreme Court’s. But there’s nothing “over-inflated” about Billy. Nope. Nothing at all. He’s no more narcissistic and self-absorbed than any other longtime amphetamine abuser, after all. And if you cannot grasp that the Supreme Court has been anti-patent (and this is not the first time in the history of the US), then you need to recalibrate yourself. Oh wait, you would rather merely enjoy the Ends, regardless of the Means. On Tuesday, TechCrunch reported that Facebook was quietly operating a research program that paid teens and adults to let the Silicon Valley tech giant spy on their phones and data, in an apparent violation of Apple’s policies. In response, Apple revoked the developer certificate that Facebook was using to power the research apps — and in doing so, crippled Facebook’s workforce. LOL. Golly I really feel sorry for those people. Not. Delighting in the misery of others…. Says the guy who thinks private citizens and companies should be abuse the patent system in order to own correlations and logic. How high on patent crack are you today? Oh, and let me know if you need me to update you regarding this Facebook company and some of their recent misery-causing mischief. Because you’re a very serious person. Nothing delusional in my comment, Billy. Go ahead and be specific, if you like. Use your words. Last time I checked you disagreed with the holding in Mayo (holding that you can’t get an eligible claim by adding a step of thinking about a new correlation to an old data gathering method). Have you changed your mind? Let everyone know. You think a claim that covers all software executing a particular function on a programmable computer doesn’t protect logic in that context? Really? How about those methods of determining whether a customer is likely to buy a product? That’s not logic? Dance for me, Billy. It’s time for you to dance. You deflected the first comment (you delighting in someone else’s misery), and then you launch into your canards and your strawmen, and then cannot seem to understand my jab at you (like you hadn’t seen it before) and you cannot seem to understand the context. I seriously have to wonder if dementia has taken ahold of you. B0ttom feeder and wanna be patent tr0 ll Ron Karpf hammered today by the CAFC. 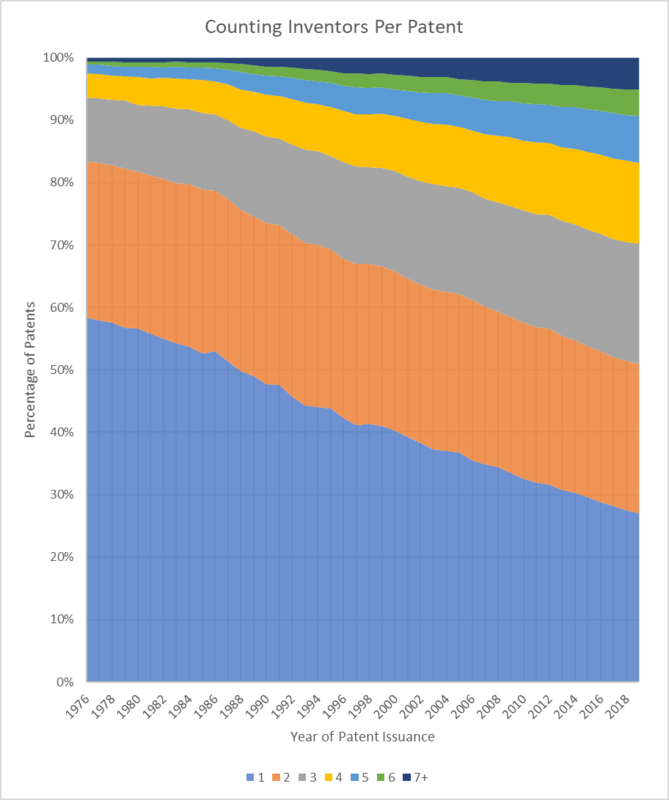 Here’s another insight why the average number of inventors per patent has increased over time: Couldn’t the reader additionally deduce from the data that the average number of inventors increased in part because of the acceleration and widespread use of information processing that since 1985 and in the 1990’s in particular took off thereby enabling teams of 2-3 or more inventors to be better equipped at solving complex problems involving a multidisciplinary approach? Having observed the above trend, this sole inventor/reader developed US Patent Application Number 15/002200 that the USPTO recently granted a Notice of Allowance thereon, on the shoulders of unobvious combinations of the physical components combined in the as-used positions described in this sole inventor’s patented upgrade which has been preceded by the cited prior art of other patents and technologies developed or discovered by teams of 2-3 or more inventors in the last 30-40 years. Neither this patent application’s cited prior art patents nor the entire dental profession of dentists and dental hygienists could forsee such a patented upgrade to all regular string dental flosses that was not feasible without the prexisting trend of “teams of inventors” and/or mass computing power at the fingertips of a grateful sole inventor. Thank you, Dennis. So the median has gone from 1 to very nearly 3, and the distribution has become much flatter, though it’s still a ways off from a long tail distribution. Allison, Lemley, Moore, and Trunkey’s 2004 work on identifying valuable patents found that a lower inventor count was correlated with likelihood of a patent being litigated, though the effect size was small. Su, Chen, and Lee performed a similar analysis in 2012 using patents issued from 1976 – 2010 and got similar results. As the distribution continues to become more complex I wonder if inventor count will become more relevant or if the AIA making inventorship largely immaterial from a substantive patent law perspective will wash out whatever informative value inventor count might have had. Interesting for me is the difference between USA and EPC when it comes to adding or subtracting an inventor after the list has been given to the Patent Office. At the EPO it is a mere formality to add an inventor but can be problematic to delete one. If I understand it right, the opposite is the case at the USPTO. Who can explain the difference, the underlying different logic? Might such explanation throw further light on why FItF is stimulating longer lists of named inventors? It is definitely not a mere formality to remove an inventor in the US. It will frequently require a Rule 48 petition from the person being removed, agreeing that the one to be delisted was wrongly listed, without deceptive intent. Tracking down the wrongly listed inventor to get that petition signed can be a real headache. It is usually slightly easier to add and inventor than to remove one, but neither process is super easy. Thanks Greg, for correcting my misapprehension. I had in mind the situation (by far the most common outside the USA) where Applicant is not the inventor(s) but, rather, their employer, the assignee, the owner of the patent application. I was thinking, if Applicant petitions to add an inventor, why should the Patent Office put any obstacle in the way? I would say that adding an inventor post-AIA is “super easy”, at least up until the patent is granted after which it’s still not terribly difficult. Deleting is more of a headache, relatively speaking. ALL references to “Deceptive intent” were removed wholesale by the America Invents Act. … a commonly recurring misnomer is that the ACTUAL number of individual inventor related items has been in sharp decline. This misnomer can be easily rectified with a simple graph showing the trend of actual numbers over time for individual inventors. See the chart with underlying numbers rather than proportions. Thanks for that. Some of those comments are hoot, and others are quite thought-provoking. I rather wish, for example that Kevin Arruda would have further expounded on his assertion that “in my practical experience (12+ years as a software engineer),… I’ve learned… [that v]ague software patents and “patent trolls” have both stifled innovation, and essentially extorted billions from successful companies… .” Specific examples would have been interesting here. Meanwhile, how many of you agree with me that a certain anonymous “Stakeholder” who offered two comments (one on 4 Jan 2019 and one on 5 Jan) is also a regular around here? The verbal tics of using 30 words where 5 would do, and an overwrought concern for “all those inventors, companies, and their counsel who have been waiting anxiously to file their briefs until this new guidance came out…” seem… familiar. Whether familiar or not (and I really do not care to guess just who you think is that person), your attempt her to single out “Stakeholder” with only a comment on identity is more than a bit odd. That you also appear to link KA with “thought-provoking” is not all that thought-provoking, but merely shows an underlying bias of yours. By the way, Kevin Arruda is NOT on the USPTO list of practitioners (he even admits to being neither a patent expert nor lawyer). His view is clearly a biased and uninformed (and unhelpful) view, as he omits entirely that software is merely a design choice of wares and that ANY item of software could be in fact rendered completely or alternately in various combinations of the other wares design choices (hardware and firmware). It may be better stated that his 12 years of experience reflect 12 years of quaffing anti-patent Kool-Aid that happens to run amuck in certain circles of the software arena. Meanwhile Kristy J Downing is a registered patent attorney (albeit, whose views I do not share). Of course, you speak out your @$$. Doubtful. Have you filed your first PCT application yet? Some firms don’t let struggling agents like you near those things. You speak with ZERO basis – and can have zero basis. In other words, you speak out of your @$$. Additionally, I have provided a long history of discussion points (and counter points) that exhibit a far better handle on actual patent law than you. You want to make unfounded accusations against someone more knowledgeable than you, which then — with your “logic” places you in even worse a situation that you Accuse Others Of. That’s not a position you should aspire to take. Then grow up and do it, Billy. Go ahead. Impress everybody. Claim the hardware in structural terms distinguishing it from prior art hardware. You know: like a grown up patent attorney does. Yet again, you seem unable to grasp the nature of something being optional. (yes, we both know why). anti-patent Kool-Aid that happens to run amuck in certain circles of the software arena. Agreed. There’s also appears to be similarity in quanity of submissions relative to the median quantity of submissions. Fortunately, the excesses of Malcolm Mooney are not reflected there. other meaningful way beyond generally linking the use of the judicial exception to a particular technological environment, such that the claim as a whole is more than a drafting effort designed to monopolize the exception” gives examiners a lot of leeway to disregard claim elements that do little more than substitute a computer for a human (e.g., “add 2+2 WITH A COMPUTER”). judicial exception in conjunction with, a particular machine or manufacture that is integral to the claim” clearly means “the claim is like the Diamond v. Dieher” claim. Similarly, the Spieler comment seems to state that, under the new guidance, the eligibility test is satisfied if an improvement is found somewhere in the specification, regardless of what’s in the claim. But the guidance is very clearly focused on “element[s],” i.e., the claim language. And the Gross comment appears to be that there is some difference between “improving the functioning of the computer” and “improving the functioning of the computer itself.” I don’t quite understand the distinction. Perhaps the latter means “the invention improves the functioning of the computer on which the invention is implemented” and the former could mean “the invention improves the functioning of the computer on which the invention is implemented or some other computer”? Are there many claims whose eligibility hinges on that distinction? And the Gross comment appears to be that there is some difference between “improving the functioning of the computer” and “improving the functioning of the computer itself.” I don’t quite understand the distinction. An “improvement to the functioning of the computer itself” would be an improvement that increases the speed or efficiency of every logical operation or every storage operation or every retrieval operation carried out by the computer, regardless of the “meaning” of the digital bits being processed. This is an objective test that would require evidence and many (most?) claims would need to be limited to the specific operating system (and specific hardware environment) on which the evidence was demonstrated in order to satisfy the test. An “improvement to the functioning of the computer” would be literally anything “new” that a computer is programmed to do because somebody, somewhere, might see that as an “improvement” in some context. It’s a worthless, self-serving, subjective test. Well, whoever “Stakeholder” is, s/he does raise some interesting thoughts / concerns.
. . . and as for the currently small number of comments, I’d expect many more have — and now will — come in and be posted in the days and weeks to follow. They are moderated, and — unlike with blogs — the comments are posted in batches; not immediately as they come in. Well, whoever “Stakeholder” is, s/he does raise some interesting thoughts / concerns. Thoughts anyone? Go back to Big Jeans echo chamber and sponge the flopsweat off the walls like a good little sycophant. You obsess10n is showing again Malcolm. Greg: The verbal tics of using 30 words where 5 would do, and an overwrought concern for “all those inventors, companies, and their counsel who have been waiting anxiously to file their briefs until this new guidance came out…” seem… familiar. Unfortunately “anon” isn’t the only patent maximalist out there who writes like a dweeb teenager who learned English from reading Atlas Shrugged ten times and watching the History Channel. Your ISMs are showing Malcolm. and some type of odd culturalISM from the combination of Atlas Shrugged and the History Channel as an attempt to insult based on use of language. Maybe spend less time hunting for insults (which only come across as mindless no matter how much effort you put into them) and spend more time actually addressing substantive issues (in an inte11ectually honest manner). The start of your 15th year is a great time to start! That’s discrimination on the basis of national origin (in some people’s words this is called “nationalISM” distinct from how nationalism is usually used in the political arena). And the whole patent field discriminates based on national origin because of the requirement to file in english and conduct business in english, and the english skills reqd to get hired in the office and outside the office etc. But — gasp — Malcolm’s on the wrong side of this ISM (as you present it). Here, he’s degrading those “afflicted” with the impaired English skills. He’s going to lose his “Muh Victum” card doing that, isn’t he? Nah anon, I doubt it. Because money is always an answer for an indescretion of Malcolm’s type, eh? Oh wait. Isn’t that the very type of thing that he whines about? Money is a large reason why the “victim card” exists. Why, its humanitarian! You don’t oppose humanitarianism do you anon?!?!?! 6 – my reply is caught in the filter. Your “anti” is misplaced, as you are THE eminent doush. Just tell us who it is Greg lol. I’d also love to see this divided up by a couple of other factors: (1) foreign versus domestic filing, and (2) technology area. For (2), an approximation might be the first character of the first IPC or CPC symbol (A-H).